LOCATION: Approximately 2 miles northeast of Ocean Springs, Mississippi in the NW/4 of the NW/4 of Section 21, T7S-R8W. 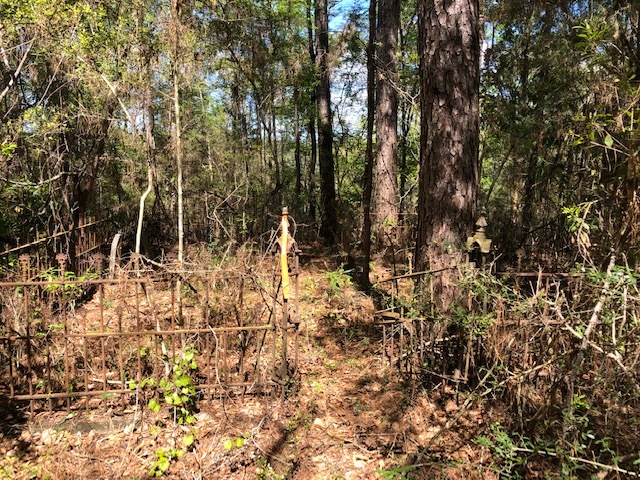 This pioneer cemetery is located on private property in the St. Martin School area. The terrain is pastoral and scrub woods on the east bank of Bayou Talla. DIRECTIONS: From the intersection of Bienville Boulevard (US 90) and Washington Avenue at Ocean Springs, go north on Washington Avenue 1.65 miles to Old Fort Bayou Road. Turn right (east) on Old Fort Bayou Road and go 1.8 miles to Bayou Drive-Yellow Jacket Boulevard. Turn right onto Bayou Drive and go 1.2 miles to Kippie Cut-Off Road. Bear right onto Lemon Road for .6 miles to the home of Fred Lemon. The old cemetery is about 1000 feet northwest of the Lemon home. This is private property and permission to enter is required. HISTORY: Joseph Basque (Jose Vasquez) (1804-1860) was a Spanish immigrant from Galicia Province in the northwest part of that nation who probably came to the United States in the 1830s. He married Henrietta Pauline Cuevas (Quave) (1815-1866) at Cat Island in the Mississippi Sound in 1837. She was the daughter of Juan Cuevas and Marie Helen Ladner. Their first child, Francois, was born at Cat Island in 1838. Nine additional children were born of this union: Josephine (1840-1881), Joseph (1841-1935), Theresa (1843-1910), Harriet (possibly called Henrietta?) (1847-1875), Caroline (1848-1924), Mary (1852-1917), Bernard (1854-1920), Seymore (1855), and Pauline (1859-1946). The Basques departed Cat Island for the mainland in the 1840s. They settled in the north half of Section 21, T7S-R8W on Old Fort Bayou just northeast of the village of East Biloxi (became Ocean Springs in 1854). Here Joseph Basque made his livelihood as a sailor and later as a baker. He had an account in the store of Pierre Quave at Back Bay (North Biloxi) in the late 1850s. The State of Mississippi granted land patents in T7S-R8W to Joseph Basque on 40 acres in the SE/4 of NE/4 of Section 21 (12-4-1855) and 40 acres in the SE/4 of the NW/4 of Section 21 (9-23-1856). Basque later acquired other lands in Section 21. 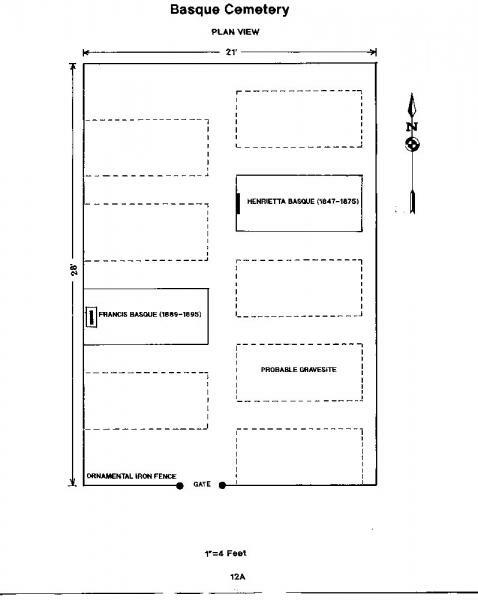 When the estate of Joseph Basque was divided among his heirs on June 2, 1879, Bernard Basque was granted the NW/4 of the NW/4 of Section 21, T7S-R8W, "except 150 feet square in the southwest corner reserved for the family burial ground." He also received the NW/4 of the NE/4 of Section 21. (Jackson County, Ms. Land Deed Records Book 4, pp. 234-236). The Old Basque Cemetery is over one hundred thirty years old. It lies in a sylvan setting of scrub pines, small oaks, cedars, and shrubs on the north bank of a small tributary, which flows from the east into Bayou Talla. 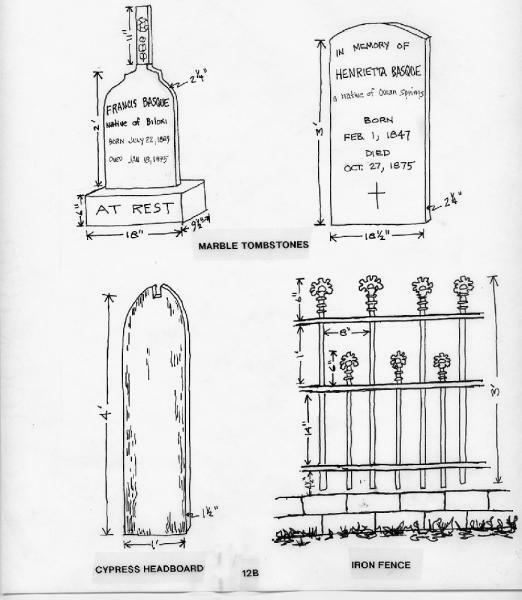 The cemetery measures 21 feet by 28 feet in area. Its perimeter is totally enclosed by a three foot tall, ornamental, iron fence and gate. There are two marble tombstones, Francis Basque (1889-1895) and Henrietta (Harriet?) Basque (1847-1875). Today four, highly weathered, cypress headboards still remain at the Basque Cemetery. Bernard D. Basque [1921-2015] who lives about 1/2 mile to the northeast remembers in his youth that there were about eight wooden markers present. Mr. Basque, a descendant of Joseph Basque, has maintained their family cemetery for many years, which attests to its fine condition. 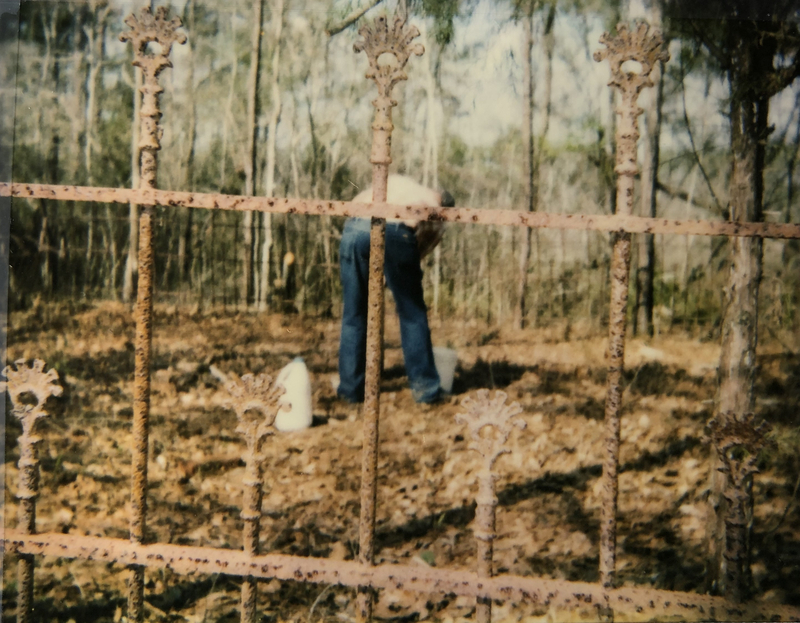 The iron fence is slightly bent in places where large pine trees fell across it during hurricanes of yesteryear most notably Elena in the fall of 1985. Nap L. Cassibry, II, The Ladner Odyssey, (Mississippi Gulf Coast Historical & Genealogical Society-Special Issue No. 6: Biloxi - 1988), pp. 732 and 773-774. Joseph Kermit Fountain, The Edward Lattimer-Louise Letort Family, (1990), p. 2. (Biloxi Public Library Open Files). Pierre Quave Store Journal (1857-1862), (Archives of the Biloxi Public Library: Biloxi). US CENSUS Jackson County, Mississippi 1850 and 1860.